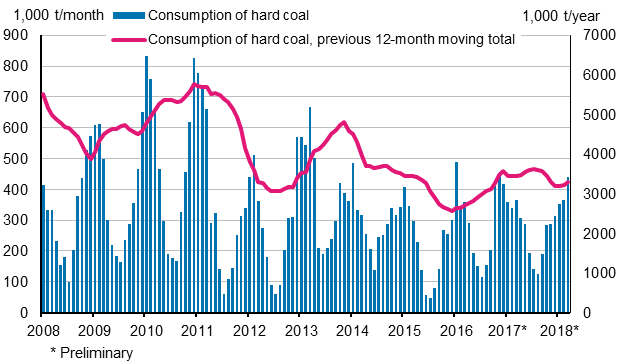 According to Statistics Finland's preliminary data, the consumption of hard coal increased by nine per cent in this year's January to March compared with the corresponding period of last year. The consumption of hard coal as a fuel in the generation of electricity and heat amounted to around 1.2 million tonnes, corresponding to 29 petajoules in energy content. In January to March, 27 per cent less hard coal was consumed than on average during this millennium. The data for 2017 and 2018 are preliminary. The consumption of hard coal grew due to the colder February and March than in the previous year. Seven per cent more hard coal was consumed in February and 21 per cent more in March than last year. In January, two per cent less hard coal was consumed than in the year before. Hard coal consumption in Finland typically fluctuates seasonally. Some of the fluctuation is explained by the natural variation in the need for electricity and heat between the summer and winter seasons. The difference between statistical reference years is explained by variations in the demand for heating energy and the Nordic water situation, which particularly influences the electricity exchange price and thus the demand for separate production of electricity as well. Therefore, long-term consumption development cannot be deducted from the change in hard coal consumption in successive years. Stocks of coal amounted to 1.5 million tonnes at the end of March 2018, which was 26 per cent less than one year earlier. ISSN=1798-2588. March 2018. Helsinki: Statistics Finland [referred: 21.4.2019].